Just over two months after three bandits robbed and killed a Bourda Market cheese vendor, a second robbery attempt was made in the wee hours of Sunday morning. But this time, the bandits were the unlucky ones. Suspected bandit Shane Allison being taken to the hospital. One robber was shot by a security guard that vendors hired after the cheese vendor was slain. 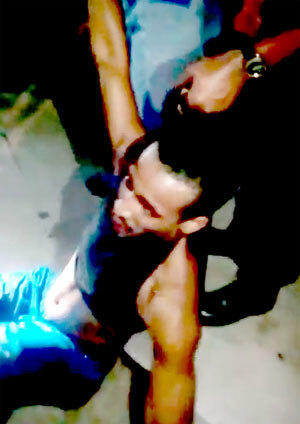 Police said that the suspect, Shane Allison, was shot by a security guard at around 02:00 hrs when he attempted to rob a Bourda Market vendor on Robb Street, between Bourda and Alexander Streets, not too far from where the last vendor was killed. Allison was shot in the foot and hip while two of his accomplices were arrested. Kaieteur News learnt from a witness that Allison and two others came to the location in a minibus. Allison, who had a handgun, approached the vendor and attempted to rob him. A security guard, who a short distance away confronted him. Allison reportedly turned his firearm on the guard, who shot him in the foot. The minibus that the suspected bandits were moving in. Allison ran into a yard then fled into an alleyway. The witness claimed that she heard a few more gunshots and heard Allison wailing loudly. Quick response by City Police from the Bourda Outpost saw Allison being apprehended and taken to the Georgetown Public Hospital Corporation where he was admitted under guard. 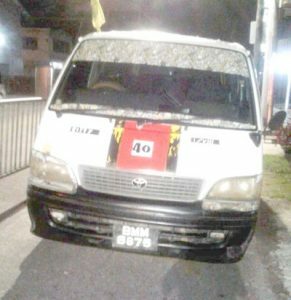 Based on information received, constables who acted quickly were able to apprehend his two accomplices who were still in the minibus. They were later handed over to ranks of the Guyana Police Force from the Albertown Police Station. Police in a statement said 21-year-old Shane Allison, a miner of Pouderoyen, West Bank Demerara allegedly whipped out a handgun and pointed it at the guard who discharged his weapon several times at the gunman, who collapsed a short distance away. An unlicensed .32 pistol with six live matching rounds were retrieved next to the injured suspect. The statement also listed two other suspects as being a 34 year-old of Nelson Street, Mocha, East Bank Demerara and a 23 year-old of Pike Street, Kitty, Georgetown. The security guard is assisting with investigation.